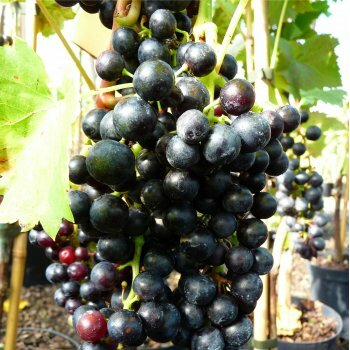 'Regent' is a self fertile outdoor grapevine with good disease resistance. It produces large blue-black grapes with a sweet, refreshing flavour. The grapes are suitably for desserts, culinary use and wine making. They make wines with cherry aromas, moderate acidity and good colour. With an upright growing habit, Grape 'Regent' has green foliage that turns attractive shades of bright orange and red for autumn.